With so many moving pieces needing to work in sync, an Internet marketing lead generation campaign is like an intricate machine. And, like any machine, it requires a blueprint or diagram to understand exactly how it works — and how to keep it running in optimal condition. However, far too many businesses leap into the fray without a clear idea of what their campaigns should look like, and they end up lost when trying to figure out how to optimize them. Here at Internet marketing agency Straight North, we’ve spent a great deal of time studying what makes the most successful lead generation campaigns on the Internet work. After examining them closely, we’ve created the following infographic to illustrate how the ecosystem of lead generation should look. 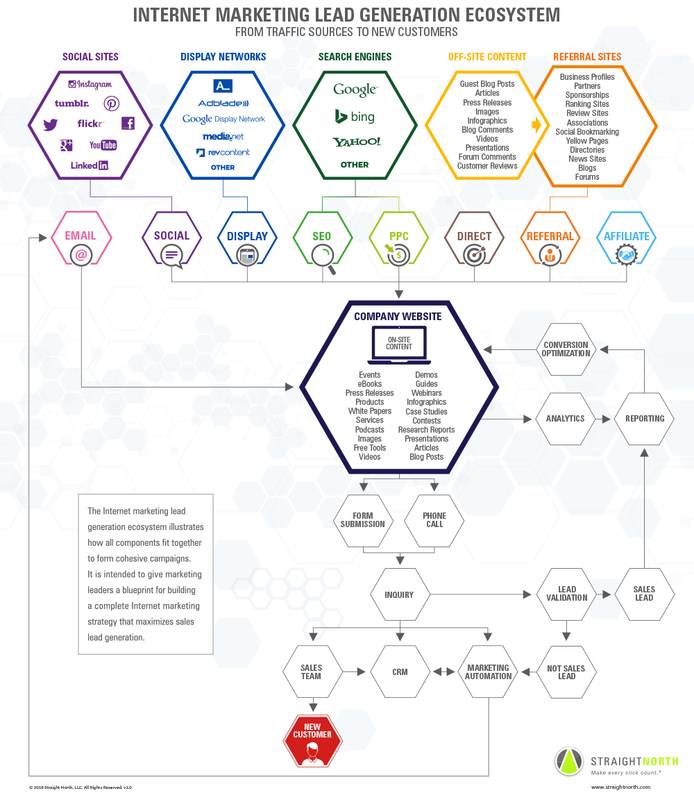 This flowchart details the most important elements that successful campaigns should have, and shows how they fit together. This can serve as an important blueprint for anyone building a lead generation campaign from scratch or working to fine-tune an existing campaign. Unless you know what’s supposed to go into such an intricate machine, you won’t know if anything is missing — so take a closer look at this blueprint, and make sure your lead generation campaign is running as effectively as possible.